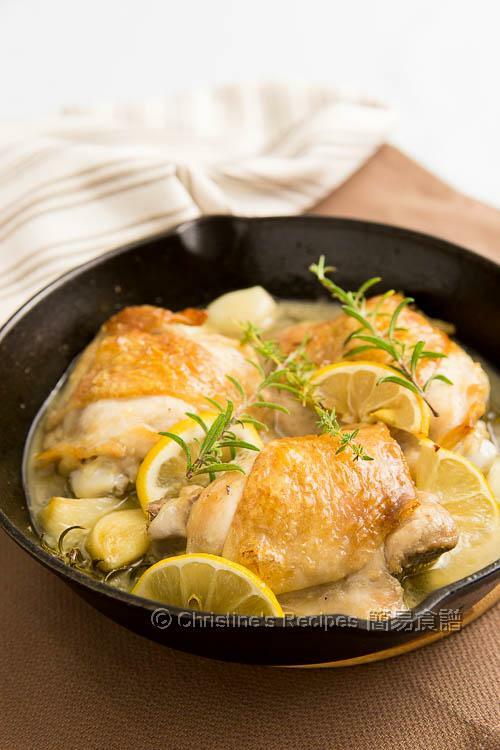 These chicken thighs were cooked with lemon, garlic and my favourite herds, rosemary and thyme. My kitchen was full of the fragrant smell, increasing the appetite of the whole family. I’m getting to love one-pan dish more and more. It’s handy and save up energy to do cleaning up, just like one-plate dish. The taste of one-pan dish won’t be comprised at all, still very delicious. 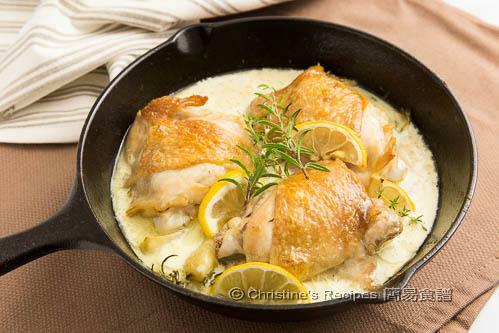 The lemon and herds cut through the chicken meat and give you a fresh, cleansing feel. When it comes to making this dish, it’s better to use chicken thighs with skin on as the skin will help to keep the meat moist. No need to worry about the oil though. The oil will be released through pan frying as a result the dish is not greasy at all. Rinse chicken thigh and wipe dry. Season with salt and pepper on both sides. Heat oil in an oven-friendly pan over medium heat. Place skin side first on pan and cook until lightly brown, letting some oil release. Turn to the other side and pan fry until lightly brown. You don’t need to cook through the chicken at this stage. Set aside and cover to keep warm. Discard excess oil in the pan, leaving about 1 tablespoon of oil to saute the garlic cloves until aromatic. Add in the minced garlic and stir to combine. Pour in white wine. Increase heat to high and cook until reduced by ⅓. Add chicken stock. Bring it to boil. Add thyme and rosemary. Put the chicken thighs back into pan. Arrange lemon slices and add lemon juice. Cover and cook for 10 minutes. Remove the lid. Transfer the whole pan into a preheated oven at 220C / 420F. Grill until the chicken skin turns golden brown. Stir in whipping cream. Serve immediately. I used a cast iron skillet that can be put into my oven. The grilling in oven will help produce golden crispy chicken skin. But you may skip this step and cook the chicken through in your frying pan instead. 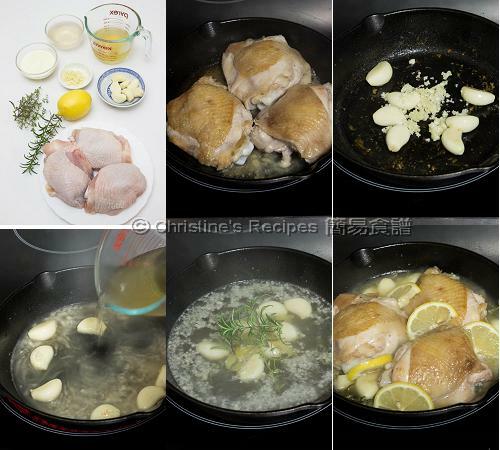 By frying the chicken skin, the oil will be released as a result the dish is healthier. If the garlic cloves are cooked long enough with the chicken stock, they can be eaten. Alternatively, you may omit the garlic cloves and just use minced garlic. As a non frequent cook myself, your recipe is really easy to follow and dish done really love them. Thanks. I don't drink wine either. I sometimes use wine for cooking only. The dry white wine is to bring in some more flavour in the dish. The alcohol will boil away and leave your dish with a fragrant smell. You can skip it if you don’t have it at hand. Garlic and lemon are the best friends, ain't they? This looks really delicious and packed full of great flavour. Exactly, Angie. I like to make this dish again. Can i substitute dry white wine with rice wine or shaoxing wine? What is the purpose of the whipping cream? Can I skip this as I don't have it. We just love a bit of creaminess and fragrance. You may skip it if it's not handy to you. Awesome! Glad that you liked this recipe. You're so clever to tweak it to suit yourself.